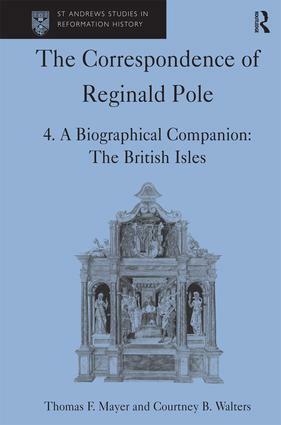 Reginald Pole (1500-1558), cardinal and archbishop of Canterbury, was at the centre of reform controversies in the mid 16th century - antagonist of Henry VIII, a leader of the reform group in the Roman Church, and nearly elected pope (Julius III was elected in his stead). His voluminous correspondence - more than 2500 items, including letters to him - forms a major source for historians not only of England, but of Catholic Europe and the early Reformation as a whole. In addition to the insight they provide on political history, both secular and ecclesiastical, and on the spiritual motives of reform, they also constitute a great resource for our understanding of humanist learning and cultural patronage in the Renaissance. Hitherto there has been no comprehensive, let alone modern or accurate listing and analysis of this correspondence, in large part due to the complexity of the manuscript traditions and the difficulties of legibility. The present work makes this vast body of material accessible to the researcher, summarising each letter (and printing key texts usually in critical editions), together with necessary identification and comment. The first three volumes in this set will contain the correspondence; the fourth and fifth will provide a biographical companion to all persons mentioned, and will together constitute a major research tool in their own right. This first volume covers the crucial turning point in Pole’s career: his protracted break with Henry and the substitution of papal service for royal. One major dimension of this rupture was a profound religious conversion which took Pole to the brink of one of the defining moments of the Italian Reformation, the writing of the ’Beneficio di Christo’. Thomas F. Mayer is Professor of History and Chairman of the Center for the Study of the Christian Millennium, Augustana College Rock Island, USA.